The Corporation do a delightful line in water based pop products. The corporation is an entity which, while being controlled by a number of living persons and controlling a greater number, exists completely separately from them. This gives the Corporation unique powers, unmatched by any other entity in the Universe. Most of secondary corporate properties are unknown, but lead to corporations being despised by nearly all liberals. It has been scientifericiously proven that only 8 corporations may exist in the entire world at any given time, so what you are looking at may be an "old-fashioned concern." It has also been scientifericiously proven that the Corporation is a psychopathic monster. Examples of real-world corporations include the Union Aerospace Corporation, Umbrella Inc., and the Joint Holdings Merger Conglomerate Group. The latter is known for its weed consumption. Corporations earned the right to be treated as human beings in the landmark Faceless vs. US Government case. This is due to the blindingly obvious fact that they are people, to which anyone passing them on the street will attest. However, they are definitely distinguished by their superpowers, such as AT&T's ability to turn into sand. In this form, most popular, the venturist tricks everyone in America into each buying a piece of paper saying that they, as a group, own 53% of the corporation. However, the venturist sets them up the bomb, as 60% is required for majority voting control interest. At this point, however, the system backfires on the venturist; in a process not dissimilar to overconsumption of the spice melange, the venturist sprouts long limbs and his eyes turn magenta. He, most in effect, becomes a corporation, and benefits both in his finances and in his love life as a result, although as a venturist he is indemnified by the corporation's existence and need not be concerned with the legality of his own conduct, so long as he does it through the corporation. It is in this way that Enron happened. This formation of corporations is unpleasant, but it is pursued for the destitution it can bring, due to the confusing effects of the interrobang. This variation is popular with snoots who wish to become more than married. At this point, the initiator of the corporate bond enters the other individual, commonly known as a sleeping partner due to his or her role in the relationship, into the charter. The two individuals merge, then reproduce via budding. No one buys shares in these companies because they are just too ugly. These corporate forms are unpopular outside of the programmer community. Figure out the minimum number of slaves your corporation will have. This is like reserving a domain name, because all the good ones are taken. Good corporate names that are still available include Investment-Ay Entures-Vay, Drunken Enterprises, and pepsimonkey476. This is a formal document containing rules are designed to keep you from going rampant and killing everyone with your superpowers. Everyone gets sued at one point or another, so this will make your company completely 100% bulletproof in case some brat spills coffee all over himself or herself. As well, a lawyer can tell you the correct steps to forming a corporation after having destroyed your reputation following the steps perscribed here. The act of Corporation is a rovery way to spend an evening with someone you rove. It is a well-known fact that during a call with help-desks of evil corporations, your phone will smell like... Well, you know what I mean. Please note that this is just a temporary smell and it will go away as soon as you hang up. It is important to know that quite often, the looks and feels of products produced by evil corporations are deceiving. Most of the time the products have no evil look and/or feel in them. Beware that this is just a lie which often drives people to using products of evil corporations. 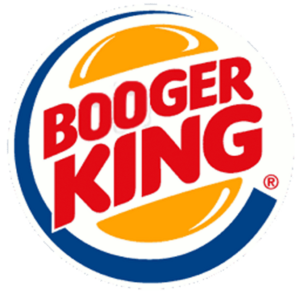 Booger King, Home of the Whopper. 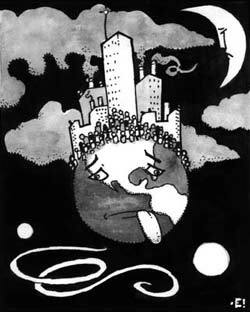 ↑ Corporation is usually preceded by forepray which reads to sexural arousal of the partners. This page was last edited on 12 July 2012, at 04:30.